RecurDyn FFlex (Full Flex) lets you combine the power of Finite Element Analysis FEA and Multibody Dynamics MBD to increase the accuracy of your simulations. With RecurDyn FFlex, you can define a flexible body by importing an FEA mesh. RecurDyn FFlex provides the most benefit in situations where flexible bodies are in contact with other bodies, or where the effects of nonlinear deformation on system performance need to be assessed. The RecurDyn/FFlex toolkit allows RecurDyn to include meshed-based Full Flex (FFlex) flexible bodies in RecurDyn models. Each node of an FFlex body has its full degrees of freedom in a simulation. FFlex is based on a nonlinear finite element technology. This technology is very efficient for modeling flexible bodies that can experience large translation and rotation and can experience large nonlinear geometric deformation, such as the rolling of paper. RecurDyn/FFlex supports both linear material models and nonlinear material models, such as elastic-plastic material that can hold a permanent deformation and hyperelastic (rubber-like) materials. RecurDyn/FFlex also has very efficient library contact elements. The elements support contact between FFlex bodies, FFlex and rigid bodies, and between FFlex and RFlex bodies (the RFlex toolkit is required for this). FFlex has a large number of beam, shell, and solid element types that allow it to efficiently model a various body shapes. RecurDyn/FFlex includes a built-in, high-quality mesher, allowing FFlex meshes to be generated internally in RecurDyn. RecurDyn/FFlex can also import meshes generated from third party meshing software (NASTRAN (*.bdf), ANSYS (*.cdb) and Design Space (*.inp)). RecurDyn/FFlex can display the stresses, strains, and displacements of an FFlex body in both graphs and contour plots. Simulation output can also be used for fatigue analysis directly using the RecurDyn/Durability toolkit (a separate purchase is required), or the output can be exported for fatigue analysis in FEMFAT. Accurately represents sliding or continuous contact along a flexible body (not possible with modal techniques). Represents flexible bodies with a local or large deformable system, including nonlinear deformation. Easy to obtain an accurate and reliable solution because RecurDyn/FFlex does not requires the pre-analysis of FE data nor the know-how of classic FE dynamics. Nodal Flexible Body Editing – A Nodal Flexible Body includes FE information and may be a complicated system on its own. For that reason it may be complicated to create or modify. The Body Edit Mode makes it easy to create and modify the Nodal Flexible Body. With the Body Edit Mode, you can do the tasks described below. Contact with the Nodal Flexible Body – One of the best features of Nodal Flex is the ability to solve for local deformation due to a contact force. You can describe various contact types as listed below. Specialized Post-Processing – Special outputs help the user understand the rich set of data that is output for the many Nodal Flexible Body entities. The data is too extensive to review by plotting. 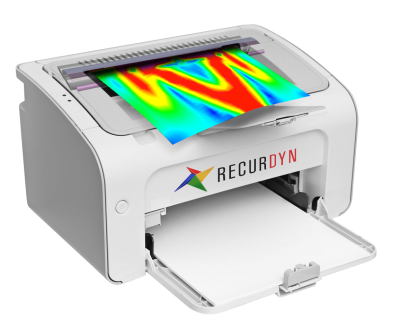 Color contours can be displayed on the surface of a Nodal Flexible Surface to indicate relative displacement, strain, and stress. The scope function can be used to see the output of nodes of interest.